23rd November 2008,the much awaiting event dawned in Puttaparthi. Interminable queues were waiting on both sides of the Ganesh Gate at the Mandhir. At ten o’clock, the Ganesh Gate was still closed to the public. The Birthday Celebrations of the Lord Sai Chandra, it was announced on the eve, were to start at 10.30am. The sun, the heat and a thick dust which rose under the creaking wheels of rushing vehicles were all at the rendezvous on the verge of the mandhir. From the window of the hotel room where I was staying I looked apprehensively at the people on the road. They had been waiting there the whole night while I had been sleeping. They were closer to God, Lord Sai Chandra, I admitted to myself. Finally, I decided to try my luck and to seek admittance at the Ganesh Gate. I hurriedly walked down the road. By the Grace of the Lord, I was the holder of a VIP ticket. Unfortunately, the security guards at the gate would not allow me in. They directed me towards the University gate. My heart sank. 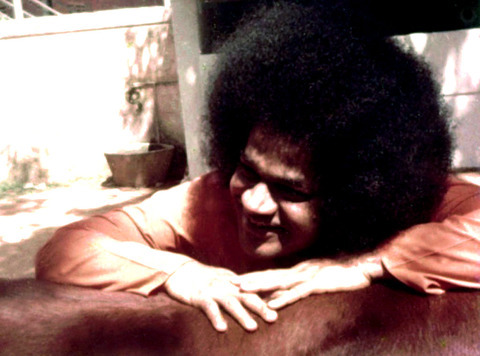 What if I missed the darshan on my Sweet Sai Chandra on that very special occasion? The Lord willing, I entered the darshan hall at the Ganesh Gate without much hassle. The VIP line faces the podium. But as soon as I found a seat on the left side of the podium,I dropped my body heavily on the floor. I did not have the heart to show my ticket to Mrs.Sourie, who was in charge of allocating VIP seats. I looked around and I realised that I was amidst feeding mothers, babies, toddlers and accompanied children. The ceremony started. I had a glimpse of the Beautiful Lord. I closed my eyes to capture the vision in my mind. We were both dressed in white silk, I pleasingly noticed. Prasad was served. I happily had my share of Birthday laddoo. Suddenly, there was a slight hustle and bustle. Every body was looking at the floor and quickly moving from their place. Was it a crawling insect, a mouse or a snake? I wondered as I slide quietly away. ‘Soo soo! Soo soo!’(Wee wee! Wee wee !) I overheard from a lovely woman dressed in a beautiful turquoise sari. Arrived late at the ceremony, she was sitting next to me. Further to my right I saw another woman hurriedly mopping the floor with a towel. Her bladder had burst, unable to put up with the long hours of waiting. Full of love for the Lord, she had held her bladder for too long… Luckily, I had made a close escape! But I added a new word in my Love dictionary on that memorable day. ‘Endurance’ was the word. In love one must learn how to endure. O Compassionate Lord! In Your Temple of Love, a special place is reserved for the Very Innocent Person! I pray that you keep me in the midst of these VIPs forever. This entry was posted in Short story, Uncategorized by Anita Bacha. Bookmark the permalink. May Lord Sai bless you my dear friend…!